Today, I would like to introduce you to a food that I tried for the first time in a little bistro in Paris. It took me by surprise because it’s a simple food but with a very unique texture. 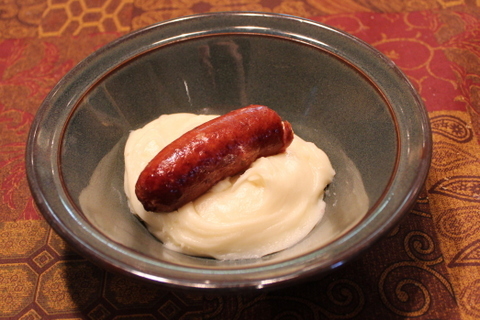 It’s called Aligot and it’s basically mashed potatoes with cheese. 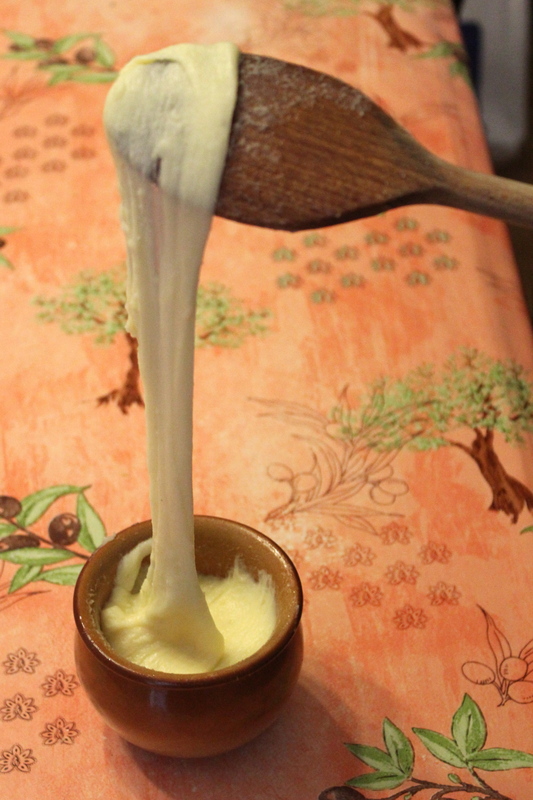 But the unique thing about aligot is that the potatoes are puréed finely and then enough cheese is added to give the potatoes a smooth, stretchy texture. The experience of eating it lies somewhere between mozzarella sticks, mashed potatoes and bubble gum. More than anything, it’s a really FUN dish to eat, and is guaranteed to go over well with kids. I confirmed this today with my niece who loved the stringy strands of cheesiness. Apparently, the origin of this dish lies in a monastery in Aubrac (in the mountainous Massif Central in central France) where pilgrims would stop on their way to the holy site of Santiago de Compostela. The monks offered this dish to the pilgrims to fill their stomachs and warm them on their journey. It is not surprising that this would be served to comfort the traveler since it is about the most comforting dish you can imagine. It is a dish that warms the soul on a cold night. As you may have noticed, it is not cold at all, and our bodies, if not our souls, are plenty warm. But I went ahead and made some anyway, and enjoyed it nonetheless. This is the kind of thing that is wonderful served with a sausage or other piece of meat, or, less traditionally, with steamed vegetables. For a delicious garnish, you spread a thin layer on a plate and lay your main meat or vegetable over the top. To begin with, I tried a ready-made version that I found at the supermarket. In case you were wondering, my in-laws live literally across the street from a supermarket and we seem to end up there every day for one reason or another. 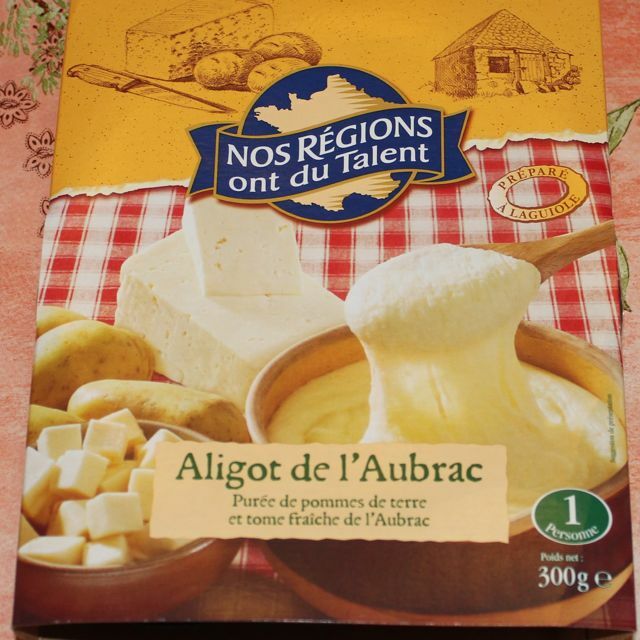 According to the package, this product is made with the following ingredients: Potato purée, fresh Tome de l’Aubrac cheese, whey, salt. Tome de l’Aubrac is an un-aged (fresh) version of the cheese Cantal, a mountain-style cheese from Auvergne (other mountain-style cheeses include fondue-friendly cheeses such as gruyère and emmental). The texture may be unlike anything you’ve had, as it is silky smooth, stretchy, and yet starchy at the same time. The taste is a lovely combination of nutty cheese and potato. As usual, I would like to offer you a version that you could make for your kiddos or for yourself. Like many French dishes involving cheese, (gratins, crêpes, tartiflette, and raclette to name a few) the only way to truly reproduce the authentic flavor would be to get French cheese. French cheeses have a nutty, stinky (in a good way) quality that most cheeses found in US grocery stores just do not have. So I would recommend getting a small piece of gruyère, beaufort, or other fondue-type cheese, and mixing it with a less expensive (melting) cheese such as shredded or finely cut mozzarella or provolone. If not, then just go for any melting cheese you like. The trick here is not to be shy with the cheese. What you basically want is cheese suspended in potato…or potato suspended in cheese. This also means that it is very rich and a little bit goes a long way, so each person needs just a small amount. 4-5 baby potatoes makes enough for at least 4 servings. Steam or boil the potatoes until very soft. Drain and purée in a food processor or blender. All of this can be done in a Babycook if you have one. 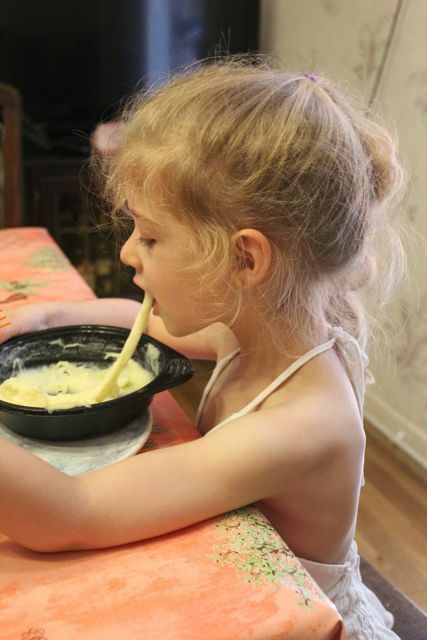 Transfer to a microwave-safe bowl and add cheese. Stir. Re-heat the potatoes in the microwave and stir as needed until the mixture is smooth and stretchy. Adjust the amount of cheese based on the amount of potatoes to achieve the stretchy texture. You will need to re-heat the mixture again just before serving in order to make the cheese gooey and stretchy again. A great way to eat this is with chopped cooked broccoli. Take a little broccoli and a little potato with each bite. For the more sophisticated palate, serve with steak and sautéed mushrooms and top with a drizzle of truffle oil. Yum!